Dung’s famous abstract argumentation frameworks represent the core formalism for many problems and applications in the field of argumentation which significantly evolved within the last decade. Recent work in the field has thus focused on implementations for these frameworks, whereby one of the main approaches is to use Answer-Set Programming (ASP). While some of the argumentation semantics can be nicely expressed within the ASP language, others required rather cumbersome encoding techniques. 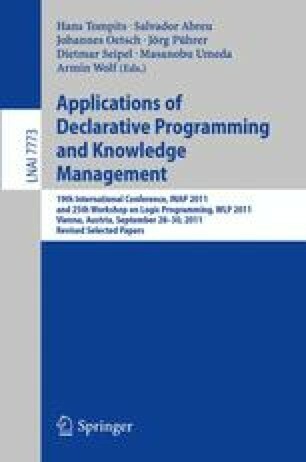 Recent advances in ASP systems, in particular, the metasp optimization front-end for the ASP-package gringo/claspD provide direct commands to filter answer sets satisfying certain subset-minimality (or -maximality) constraints. This allows for much simpler encodings compared to the ones in standard ASP language. In this paper, we experimentally compare the original encodings (for the argumentation semantics based on preferred, semi-stable, and respectively, stage extensions) with new metasp encodings. Moreover, we provide novel encodings for the recently introduced resolution-based grounded semantics. Our experimental results indicate that the metasp approach works well in those cases where the complexity of the encoded problem is adequately mirrored within the metasp approach. This work has been funded by the Vienna Science and Technology Fund (WWTF) through project ICT08-028.